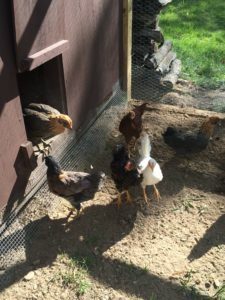 We are quite excited to have the chicken coop and run finished, and have our chickens out in the fresh air and sunlight. 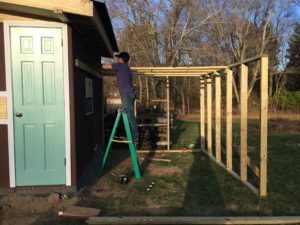 The total costs for the coop construction came in around $1,000. It will take a few years of eggs at $5-$7 a dozen to pay back the initial investment for the coop, but we are seeing the benefits immediately. A major goal of ours is to show an example of ways to live with a greater connection to our food systems. What better way than having chickens running around in a suburban space. Our first weekend after the run was finished we showed off the new kitchen and coop to friends and family. We were able to bring the kids up to the fencing and see the chickens, and see them up close. Once we start getting the eggs we’ll be able to show exactly how we get the eggs and the conditions they have to live. We will be able to get a lot more good quality compost with high nitrogen content from the chickens. $400 – Wood for the coop construction. We reused 2×4’s we had, so not all the materials are included in the cost. $80 – Roofing material – Ondura roofing fit the dimensions we needed. 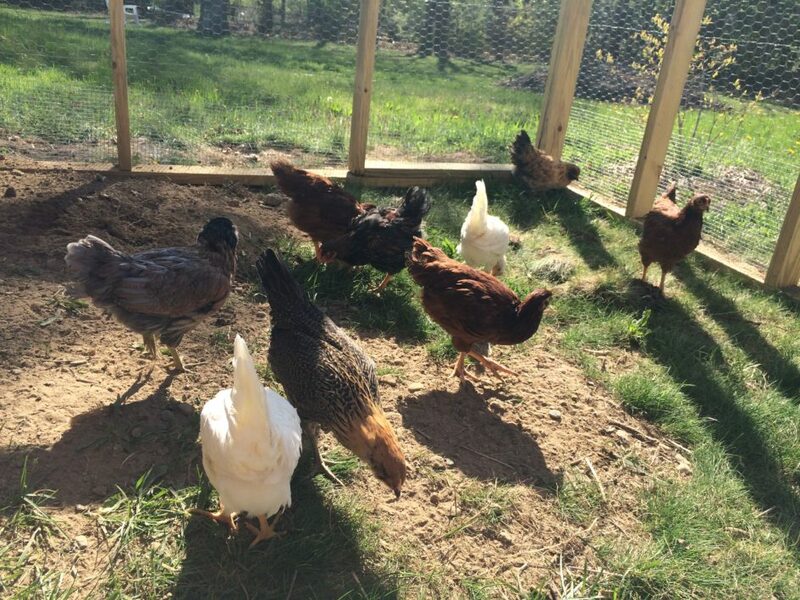 $250 – chicken wire and pressure treated wood for the fenced in run. Free labor, took 2 full weekends plus some spare time here and there to finish it up. So glad to have the help of Elise to get done in slightly quicker time. There are a number of ways to get the costs down cheaper than what we built ours, but we had a few things we wanted to do with this structure. We wanted it tall enough for us to walk into the coop and the run, and we wanted to be able to house a good number of chickens. Our coop is big enough for 25 birds. 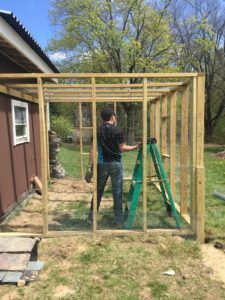 The enclosed coop is 5’x10′ for 50 square feet total. The recommended size is 2 square feet per bird, so we could max out the coop at about 25. The run is a bit smaller at 80 square feet and would allow us about 13-15 birds total. 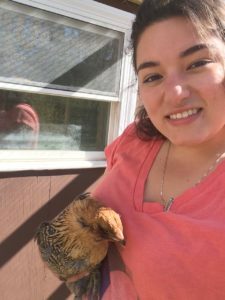 The rule of thumb is 10 square feet per bird in the coop and run combined. We could expand the run and accommodate more chickens in the future if we wanted to expand. For now we will stick with the flock of 10 chickens and give them a little extra space to be happy and healthy. Last we left it the coop was complete and we moved the chickens in. They still couldn’t get sunlight since the outdoor run was not complete. We went out and bought pressure treated 2×4’s to build the run off the coop. We built a very basic structure that wobbles a little bit, but shouldn’t be a big problem. 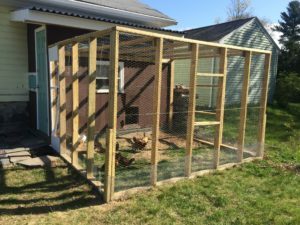 We covered the whole run in 1″ hex chicken wire, and the bottom 1.5’ has a 1/2″ mesh wire buried about 6″ in the ground to prevent predators getting in. We’ll probably line the edges with rocks as well. A month after we started, we were officially able to let the 6 week old chickens out into the run. Overall it was a fun month of trips to the hardware store, hammering, measuring, cutting, hammering again. Only a few frustrations, but looking out and seeing the chickens having their own space is very rewarding.